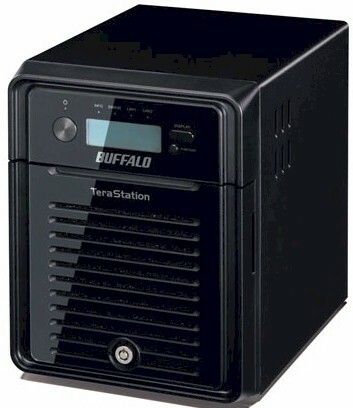 Since Buffalo America’s (formerly Buffalo Technology) announcements of the new TeraStation 5000 and 3000 series of NAS devices, we have been busy evaluating the latest offerings. Tim reviewed the TeraStation TS5800, an eight bay NAS that sits at the top of the 5000 series product line. More recently, Scott took a look at the TS5200, the entry level two drive member of the 5000 series. This review will focus on the TeraStation TS3400 – a four drive ARM-based NAS. Unlike the 5000 series that has five members of its product line, the 3000 series has just two: The TS 3400 and the TS3400r Rackmount. Both of the 3400’s have the same specifications – the difference is the form factor. Both TS3400 models are available in 4 TB, 8 TB, 12 TB and 16 TB configurations. The family chart below gives you a good idea of where the TS3400 fits in. While you’ll note that all of the feature checkmarks for 5000 and 7000 series of TeraStations are also checked in the TS3000 column, the major differences are in the processor, amount of memory, and number of drive bays. The 7000 series uses Intel Xeon processors; the 5000 series uses Intel Dual core Atom processors; the 3000 series uses less powerful dual core ARM processors. As you would expect, as you move up through the product lines, the memory increases. The TS3400 has 1 GB of DDR3 memory. As with the 5000 series, the TS3400 has a lockable drive bay door. #12 in the callout chart below is a VGA port for console access. An LCD panel and LEDs provide a useful status information. If you check back on the reviews of the TS5200 and the TS5800, you’ll note that there is a lot of similarity when it comes to case design and PCB layout. The image below shows an internal view of the TS3400. The PCB is mounted vertically along the right side (looking at it from the front) of the NAS. The power supply sits on top of the drive cage. The fan is removable without opening the case. Board replacement is easy, but you’ll need to remove the cover and the rear panel. The board plugs into the drive backplane. You can note the drive backplane connection in the lower right hand corner of the photo above. The TS3400's board resembles other boards in the TeraStation product line. It's not too surprising, as the rear panel layout, the positioning of the drive bay and the positioning of the power supply is similar on many of the models. For comparison, here's what the board looked like in the Buffalo Pro Quad. Note that all of the jacks and connectors, including the drive backplane connector are located in similar relative positions. Of course, the components on the PCB are quite different. The table below summarizes the key components of the TS3400. Corresponding components for the TS5200 are shown for comparison. Our TS3400D0404 test sample arrived populated with four WD Green 1 TB (WD10EZRX) drives. Power consumption was 36 watts with all drives spun up. Like other Buffalo NASs, you can't configure drive spin down, but you can program three sleep/wake schedules to save power. NAS noise was considered very low except when the device boots up and the fan runs on high briefly.